Badgers are, according to experts at The Badger Trust, excellent climbers. It was designed as a nature exercise for the kids at Banchory Primary, but even they were surprised by the results. The pupils, all from the P5 class at the school have been working on a project with the National Trust for Scotland’s north-east ranger service based at Crathes Castle Gardens. As part of the exercise the schoolkids, assisted by rangers, set up camera traps in and around the area in the hope they might just capture some of the local badgers. Once the badgers favourite food had been set out - peanuts, the children headed home. Imagine their surprise when reviewing the camera footage to see not only several of the normally elusive nocturnal animals, but one of them climbing six feet up a tree! Toni Watt, the countryside ranger at Crathes Castle said: “They’re quite big-bottomed creatures and not particularly agile, so you expect it to be more climbing over obstacles, rather than climbing six feet up a tree. “To be able to capture it and see it was a special experience for all of us involved. The video has now been viewed more than 15,000 times since it was posted online. Dominic Dyer, chief executive of The Badger Trust told us: “This is actually not that unusual for badgers. Being nocturnal, it’s just that few people ever get to see a badger climbing. “They’re actually well built for it, with a low centre of gravity, powerful limbs, a squat body and sharp claws, it makes them ideal for the task of climbing. 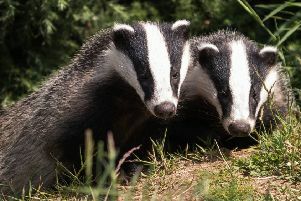 “Badgers have been found at the tops of trees when escaping flood waters, we here at the Trust have evidence of them climbing onto house roofs.